A licensed Inflatable Genie Costume including an Inflatable Top, Trousers, Belt, and Mask – Ideal for a TV & Film theme, a Disney theme or any fancy dress occasion! Break out of the lamp in style with this Inflatable Genie Costume. This official licensed Inflatable Genie Costume includes an Inflatable Top, Trousers, Belt, and Mask. This blue long sleeve Top features an inflatable chest design, with a gold sleeve cuff, that will make sure you’re larger than life at any party. This easy to inflate top uses a battery operated fan sewn into it (batteries not included). This outstanding Inflatable Genie Costume also includes a pair of dark blue trousers, a red belt, and a genie character mask to complete this fantastic look! Perfect for a Disney theme, a TV & Film theme, or any fancy dress occasion, this Inflatable Genie Costume you’ll be sure to stand out from the crowds! So grant your friends their three wishes with this incredible official licensed Inflatable Genie Costume! 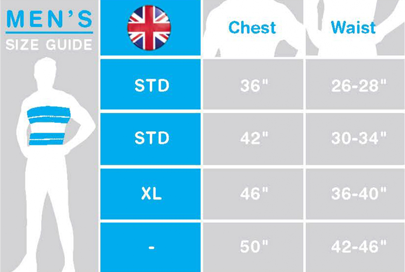 Size guidelines: to fit up to approximately a 42” Chest. A Mens Inflatable Genie Costume.